As Rintarō and Kurisu arrive home with the IBN 5100, Suzuha seems to be shocked when she sees Kurisu. 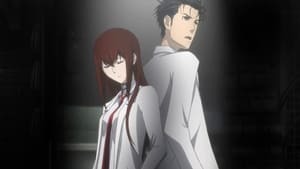 As Rintarō gathers some needed parts, he runs into Suzuha again, who warns her to be cautious of Kurisu and acts strangely when a helicopter passes by. After Hashida gets the IBN 5100 working, he, Rintarō and Kurisu begin deciphering SERN’s reports. They discover that they had indeed been experimenting with time travel, with their attempts of sending humans back in time resulting in the same jellification Rintarō had performed on the bananas. With this knowledge, Rintarō becomes determined to perfect his Mobile Microwave.